Since the weather was so chilly last week, I was searching out a way to make something for dinner that would warm us up. Stir-fry would have been tasty, but since I don’t have a good non-stick pan at my disposal yet (still in the apartment), I opted to make a faster version of a traditional Beef Bourguignon. I started with a piece of beef that was on sale at the local grocery store. I’m not exactly sure what cut of beef I purchased… I just know that there was some great marbling of fat (for yummy flavor) and it was boneless. I popped it in the freezer for a bit to make it easier to cube, then tossed the cubes of beef with some flour seasoned with salt, pepper, and smoked paprika. In the meantime, I heated some olive oil in a large stock pot and then sauteed a diced onion, a little green pepper, and a few handfuls of celery until they were softened and fragrant. I love the way the smells in a kitchen can permeate the entire apartment and make the place smell “homey”, don’t you? Once everything had a nice browned glaze to it, I moved them over and added the flour/seasoned beef to the pot. I added a little more fat (some olive oil and a little margarine) to start the browning process for the beef. This took some time, but it was well worth it. NOTE: You’re not trying to cook the beef the whole way through, you’re just browning it in preparation for the slow cooking it will do in the liquid you’ll add next. Once the beef is nicely browned, you are now going to add liquid. I like to add a half bottle of a delicious red wine (like James River Cellars Merlot, Meritage, Rad Red, or even Hanover Red). I also add about a cup of water and a beef bouillon cube to add some depth of beef flavor to the meal. Your seasonings can be added now – I like to use a bay leaf or two, some herbs de provence, some worchestershire sauce, and a glop of ketchup. Mix everything together, pop a lid on the top, and put the entire pot into a preheated 300 degree oven for an hour or two. Stir it occasionally, to make sure that you’re getting the right blend of thickness and flavors… feel free to add more liquid if it’s getting too dry and don’t forget to remove the bay leaf before serving. When you get close to dinner time, choose and cook a vegetable and a pasta of your choice. As you can see by the photo, I used spaghetti noodles and broccoli. Since my pantry is limited at the moment, I have an abundance of spaghetti, so I just broke the noodles in half and cooked them in salted water. I then put a small bag of broccoli into the microwave and cooked it until it was bright green and cooked through. I love serving this meal with wide egg noodles, but those didn’t make the cut when I was choosing what to bring to the apartment… feel free to use whatever pasta (or even a baked potato) you and your family like best. I hope my recipes give you some ideas of meals you can make for your family, even if you don’t have a lot of “extras” at your disposal. Play with what you’ve got on hand, pick up one or two essentials, and you can make a delicious dinner at home instead of spending extra money on dining out every night. I have a hard time going to a restaurant and ordering something that I know I am able to make at home. While I believe that going out should be a special experience, I do believe that staying in and making dinner for your family can bring about some pretty wonderful satisfaction as well. It’s all in how you frame the experience. Wishing you fun as you re-frame your own cooking experiences with your family! 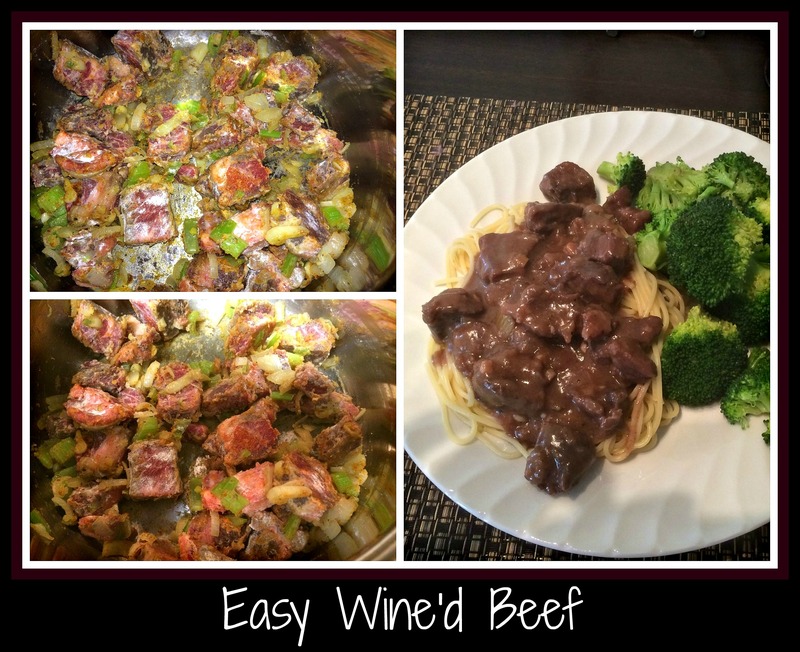 This entry was posted in Cooking, Cooking Challenges, Life, Moving, Recipe, Wine and tagged Beef, beef bourguignon, cooking at home, easy dinner, easy recipe, James River Cellars Hanover Red, James River Cellars Meritage, James River Cellars Merlot, James River Cellars Monitor, James River Cellars Rad Red, pasta, red wine, vegetables.